Life is busy here and I’m guessing it is for you too. School just started. Then there are fairs, rodeos, and other events to attend. This is also the big month for veteran’s group fundraisers. Plus, my daughter learned how to ride her bike this weekend so I’ve been getting lots of much needed exercise following her around. Oh, and traveling. Yikes! I can barely keep my head afloat right now and that means more cake mix cookies for my husband to take to work. I happen to like these ones; well ok of course I like them they’re chocolate! I hope my husband’s co-workers will too. These brownie like cookies are very good plain and don’t feel that you need to frost them if you’re in a hurry. 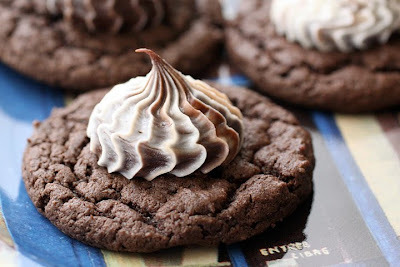 If you want to go that extra step, stuff half white frosting and half chocolate frosting into a piping bag with a Wilton tip 199 and press the frosting onto the cookies. 1. Line a couple cookie sheets with parchment paper. Preheat the oven to 350 degrees. 2. In a mixer mix the softened butter until fluffy. Add the eggs and mix until combined. There may be some little butter lumps, this is ok. Add the cake mix and beat until just combined. 3. With a mini cookie scoop (size 60), or two teaspoons, scoop the dough onto the parchment an inch and a half apart. Keep a glass of hot water nearby to dunk the scoop into after every few cookies as they dough becomes stuck to the scoop. Shake the water off well and continue to scoop the dough. 4. Bake for 10 minutes. Cool on the sheets for 4 minutes and then move to a cooling rack to finish cooling. 5. Once cooled, stuff a piping bag with a Wilton tip 199 (or any tip you want) with half fudge frosting and half white frosting. Then press some frosting into the middle of the cookie gently lifting up as you go. Once you stop pressing pull the tip away from the cookie to create a little swirl on the top. Thank-you Cheryl! Your comment made my week. I hope you and your daughter enjoy these recipes. Please let me know how her cooking adventures go. I would be so excited to hear. Laura, Laura, Laura... only you could make canned frosting looks somewhat appetizing. These look SO good! I love how simple they are too! I've been craving something sweet all afternoon and these look great. I just happen to have everthing in the pantry so you can guess what I'm getting ready to do. Thanks. I hope you like them Coleen. These look very, very good. Your husband is a lucky guy. I'll have to improvise using ingredients I can find here, but this is such a lovely idea!!! what a fantastic looking cookie! Laura, I absolutely love this! So simple and pretty. Looks so delicious! I wish I was there to help you Carol. You could have all of these decorated in under two minutes. Laura, anything that begins with "Super Moist Triple Chocolate Fudge Cake Mix" is my kind of, well, anything! Lucky husband! These look lovely and so delicious! I love your "twist" on the frosting. THANKS!!! !